Sometimes storms bring floodwaters with them. Should your home be affected by flood damages, contact SERVPRO for remediation. Recovering after a flood leaves your property full of messy debris and foul-smelling muck is a job that many homeowners in the Crossville area lack the equipment to carry out safely. Removing the debris that invaded your home only partially leaves your home woefully unprotected and considerably at risk of extensive damage in the future. It also means your family can experience unwanted health effects from exposure to any remaining chemicals or pathogens. Debris from floods includes decaying plants, soils, and thick mud, run-off from streams which can contain contamination from factories and other industrial activities, and worse. To eliminate these contaminants and other flood damage from your Crossville property, our IICRC-certified restoration specialists start with preparing to do the work safely. We always use personal protective equipment (PPE) to reduce hazards that might cause us injuries. Our full-body suits, heavy gloves, boots, and face masks let us do the work with little worry about the mess we extract from your house. Mud and more solid debris get carried out by the bucket-full. Steadily making progress, we soon reveal walls and floors that seemed lost forever under the filth left behind by the flood. We spray clean water throughout to flush anything left behind on surfaces and then begin the steps needed to make the area safe for habitation again. After inundation by floodwaters, we need to not only clean the surfaces in your home that remain otherwise undamaged, but we must also sanitize them to kill the excess microbes that might cause problems for your family. We use specially formulated cleaners that we spray onto surfaces and then wipe off after a few minutes of dwell time. Removing the waste and debris from your home on the outside also helps keep your family safe. Children often do not see the dangers in debris left behind after storms or floods, so we help get your yard and exterior areas of your home cleaned up by removing such hazards. SERVPRO of Cumberland, Morgan & White Counties remains prepared at all times, every day of the year, to help the residents of Sparta, Pleasant Hill, and Sunbright restore their properties after a disaster. Flooding can impose severe hardship on any family, but we are here to help with everything, including the messy work that restoration often requires. 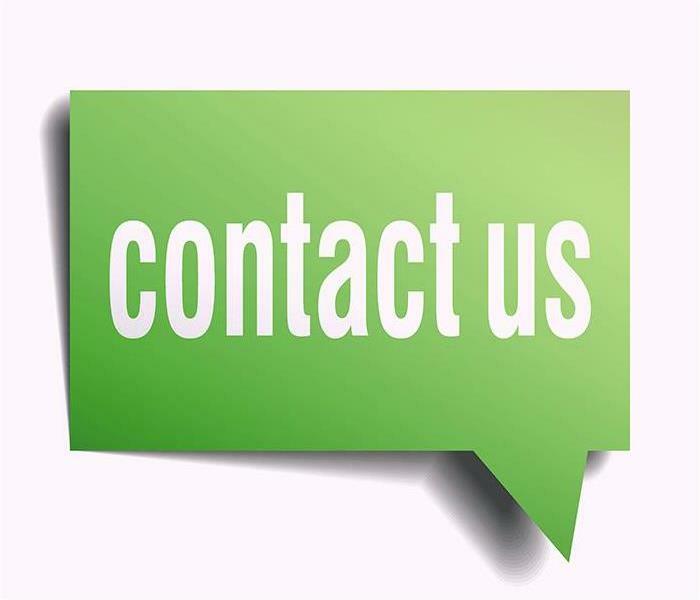 We are as close as a phone call to (931) 250-5333. Click here for more information about the city of Crossville. When Odors Linger In Your Crossville Property, Our Crew Is Here To Help! Call us at (931) 250-5333 for an assessment and fast response to this serious and nagging problem. During the time elapsed since fire roared through your Crossville home, we are proud to report a 180-degree turnaround on your property. The firefighting water and chemicals are gone, structures and fixtures are dry, all surfaces are clean, and necessary repairs are complete. Your house looks “Like it never even happened,” but a considerable concern remains. Smoky smells and an unpleasant stench of melted plastics and laminates and smoldering fabrics remains. Our job is not done until the odors are eliminated as thoroughly as the soot and charring. 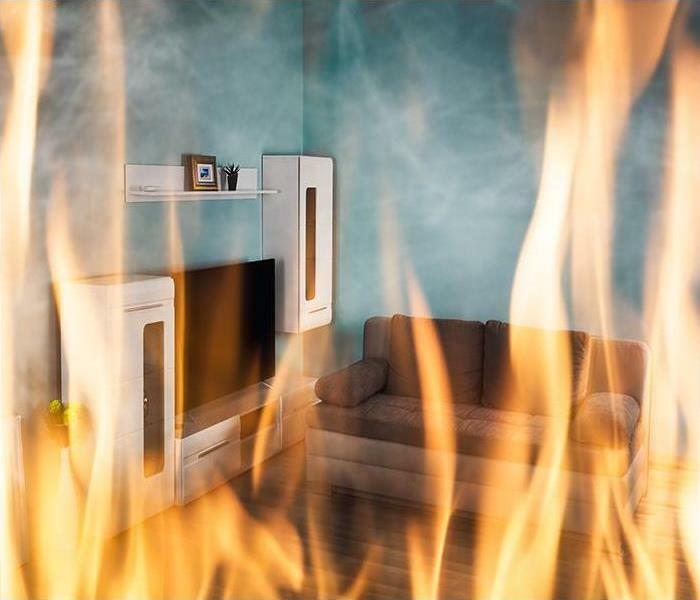 Fire damage includes odor in your Crossville abode, and it is impossible for you and your family to push the terror and worry of a household fire behind if the smell lingers. Our technicians train in advanced odor elimination, focusing on the noxious smells that the combustion of a broad range of materials leaves airborne and settled on surfaces. We follow a step by step protocol to eliminate the odors permanently, not content to use distracting cover-ups that fade away with time and frequently cause an even more distressing aroma when mixed with the fire-related odors. SERVPRO deodorization technicians first comb through the entire fire scene to make sure no burned materials remain, including behind walls, under floors, or above ceilings. If fixtures like woodwork, cabinets, and flooring retain odor-bearing particles on the surface or absorbed into the cells of the material targeted cleaning with specialized products might dislodge the smell. Sometimes sealing surfaces works to block the odors from vaporizing. This technique is sometimes used when indicated to seal off sections of HVAC and air duct systems that retain fire odors after cleaning. Odors that remain pose challenges overcome by sophisticated methods and cutting edge equipment. SERVPRO employs tools like thermal foggers that recreate the conditions during the fire. Deodorizers are combusted in heated chambers and, the fog spread to find, combine with, and neutralize odor particles. We also consider ozone machines and hydroxyl generators that change the odor-bearing airborne and settled residues at the molecular level, rendering them scentless. Rely on SERVPRO of Cumberland, Morgan & White Counties to clear the fire damage odors from your home permanently. Call us at (931) 250-5333 for an assessment and fast response to this serious and nagging problem. Click here for more about Crossville. Sometimes, life gets busy. Between work, family, and personal obligations, it can be easy to forget about the little things. A forgotten faucet can leave your home with drenched floors in need of water removal when you come home from buying groceries. Cleaning it up on your own can seem like an insurmountable task, and missed spots can lead to mold growth or damage to flooring or subflooring. This is where our professional team at SERVPRO comes in handy: not only is the stress of water removal for your Crossville home taken off of you, but our technicians can work to preserve your carpeting and flooring and prevent mold growth in your home. For many years, we have specialized in fast response to any size disaster, whether its origin is water, fire, storm, or mold. Our goal is to leave your home like no disaster took place. We're Faster To Any Size Disaster. In order to remove the water from your home, our professionals can use extractors which are either portable or truck-mounted, depending on the needs of the situation. In most cases, portable extractors are used to remove water before drying can take place. To mitigate damage from wet carpet or flooring, furniture is moved and blocked to minimize contact with water and preserve your furniture. Once water is extracted, drying can begin. For this process, our technicians use moisture sensors to evaluate what areas need drying. Walls and furniture are also evaluated. Industrial-grade air movers and dehumidifiers are used in tandem to both pull moisture out of surfaces and eliminate it once it's in the air. This increased airflow also accelerates the drying process. The use of dehumidifiers not only absorbs and eliminates moisture from surfaces, but it also prevents the secondary effects of water damage, such as swelling or warping of floors. SERVPRO of Cumberland, Morgan, and White Counties is proud to provide professional, efficient water removal services. Our emergency service technicians are available 24/7 to help you. Call (931) 250-5333 today and let us know what we can do for you. All manner of water loss incidents, including flooding in your Crossville home, can quickly damage many materials and contents within the property. While you work to get the right professional team there quickly to begin essential mitigation efforts, in emergencies, entirely preserving and protecting affected constructional materials is impossible. Damage assessment that occurs from the start of our initial arrival at your home can determine materials and structural elements too badly damaged to preserve and restore. 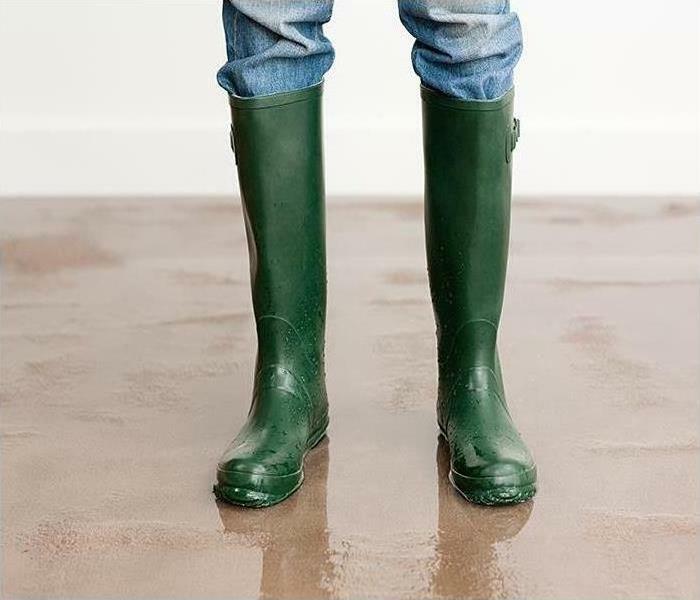 Certain materials are more susceptible to this damage in your Crossville than others, and flood removal for standing water and compromised construction is essential to begin the road to restoring the property fully. Our SERVPRO team can work quickly to determine the full extent of the flood damage right away to begin bringing in the necessary equipment for extraction and air purification to reduce the possibility of secondary effects like mold growth. Sheetrock drywall is a common staple in modern construction, but its porous composition also leaves it most susceptible to standing water and the wicking of moisture. Saturated, and often contaminated with Black Water, drywall can become unstable and bloated within as little as a day, leaving it unable in many cases to get entirely preserved even with the fast emergency response you can expect from our SERVPRO technicians. Instead, we work to preserve what we can from these exposed materials to make later reconstruction and replacement faster and more cost-effective. We have licensed contractors on our team to oversee this controlled demolition. Once mitigation work completes and the affected areas are free of lingering moisture and debris, our residential contractors can get to work on replacing removed structural elements with new materials. This seamless transition between phases of work ensures that we can get you back into your home faster than you might have expected. 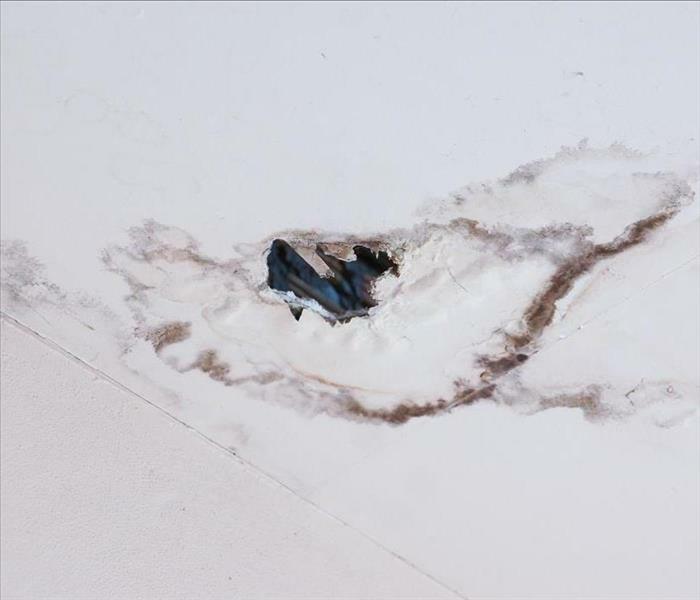 There are casualties that come with flooding in your home, and exposed drywall is often one of them. With our SERVPRO of Cumberland, Morgan & White Counties water restoration technicians and licensed contractors working together, we can make this situation “Like it never even happened.” Give us a call at (931) 250-5333. Right here is your city. High winds and heavy rains in Crossville can create power outages and flooding in the area. When your home has been affected by intruding waters, the effects can be overwhelming and devastating. Your once peaceful home is turned upside down by this powerful force of nature which does not belong indoors. No matter how much water has entered your home and created flood damage in Crossville, you want to move fast to get the water back out and dry your possessions. SERVPRO staff is standing by at all times for whenever you need us since these emergencies never happen at a convenient time. We waste no time getting to your home with our professional knowledge and tools to help you get back to life as usual. 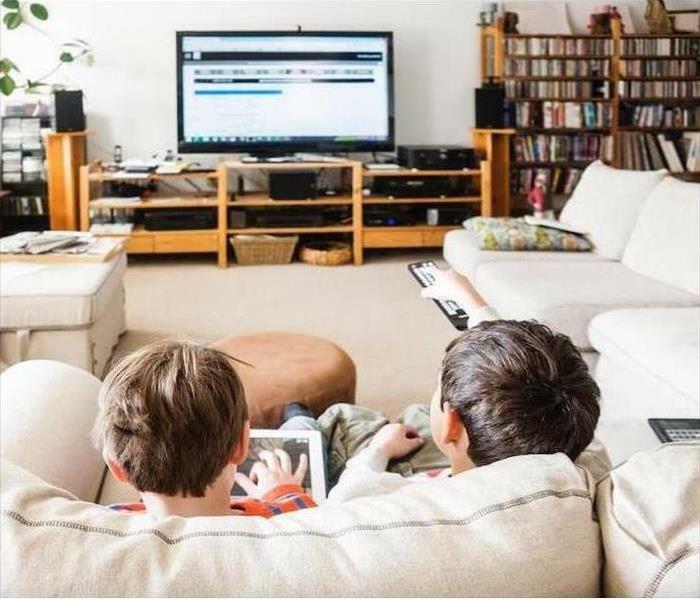 One thing that is likely affected in your home is your electronics. The most obvious examples include TVs, computers, microwaves, and stereos. We first ensure that no electrical hazards exist, and unplug all of your electronics. Any backup batteries are also disconnected, and fuses are removed, or breakers tripped. SERVPRO techs also remove any electronics from the affected area, or we at least cover them with plastic to stop any more water from affecting your valuables. We use powerful truck-mounted pumps to extract the standing water from the floor and wipe up excess water from electrical equipment. We are careful not to switch equipment on before an electronics contractor can evaluate the condition the unit is in. More damage could be caused by running an electric charge through your electronics. 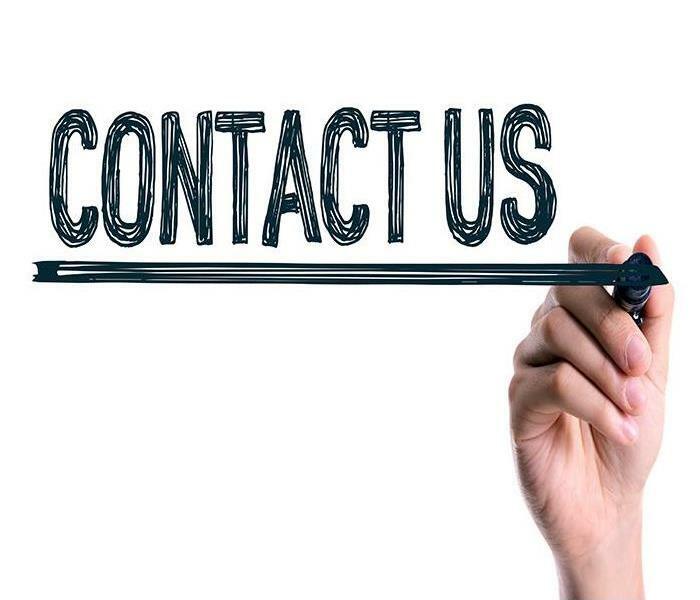 We call a qualified electronics restoration company as quickly as we can to help us evaluate the damage and restore your equipment. It is vital after flood damage that electronics are not allowed to cool to the dew point. Doing so causes condensation and corrosion, so the temperature is maintained above the dew point. When it comes to your media, such as DVDs, CDs, videocassettes, and audio cassettes, we lower the humidity as soon as possible. To do so correctly, we may need to set up a dehumidification chamber. We call in companies who specialize in cleaning and repairing media to ensure it is done right. SERVPRO of Cumberland, Morgan & White Counties understands that when you are looking at flood-damaged electronics and media, it is essential that whatever can be salvaged is done so since these items can add up to much monetary loss. Residents with a flood emergency in the areas of Sparta, Fairfield Glade, or Lake Tansi can reach us at any time by dialing (931) 250-5333. Here at SERVPRO, our IICRC certified technicians are committed to getting your Sparta property back to the pre-water damage condition quickly. Drying is perhaps the most critical step in successful water damage restoration. However, the time required to dry your Sparta property fully depends on several factors. Understanding these factors can help you establish a realistic timeline for the restoration process. Here at SERVPRO, our IICRC certified technicians are committed to getting your Sparta property back to the pre-water damage condition as quickly as possible. Our technicians use state-of-the-art technologies and a multi-modal approach for a faster drying. Here are four key factors affecting the rate of drying that you should know. Temperature is one of the most critical factors affecting the rate of drying. Warmer air can hold more moisture and can speed up the drying process. The ideal room temperatures for an efficient and speedy drying is between 70° to 80°. If the temperatures are kept higher than 85° however, the excessive moisture in the air can cause secondary damage. SERVPRO technicians closely monitor the air temperature to ensure a safe and effective drying. The amount of water to be removed also affects the rate of drying. Physical extraction of the water is most important as dehumidifiers can remove only about 30 gallons of water per day. Relative humidity is the ratio of the amount of water vapor currently present in the air to the maximum amount it can hold at a given temperature. Relative humidity (RH) over 60% can significantly slow down the drying process. SERVPRO technicians use high-quality dehumidifiers to reduce the RH and speed up drying. Blowing the damp air away speeds up the drying process. If the air becomes saturated with moisture, the evaporation slows down considerably. High-quality air movers are used to improving airflow and speed up the drying process. All these factors affect the rate of drying. SERVPRO technicians use a multi-step approach to develop a strategy that ensures a rapid and efficient drying. Call SERVPRO of Cumberland, Morgan & White Counties today at (931) 250-5333 to schedule an appointment with one of our technicians. Our technicians will work with you to chalk out a plan that ensures a rapid and efficient drying. Click here for more about the city of Sparta. When a fire breaks out in your house, the damage left behind can be overwhelming. 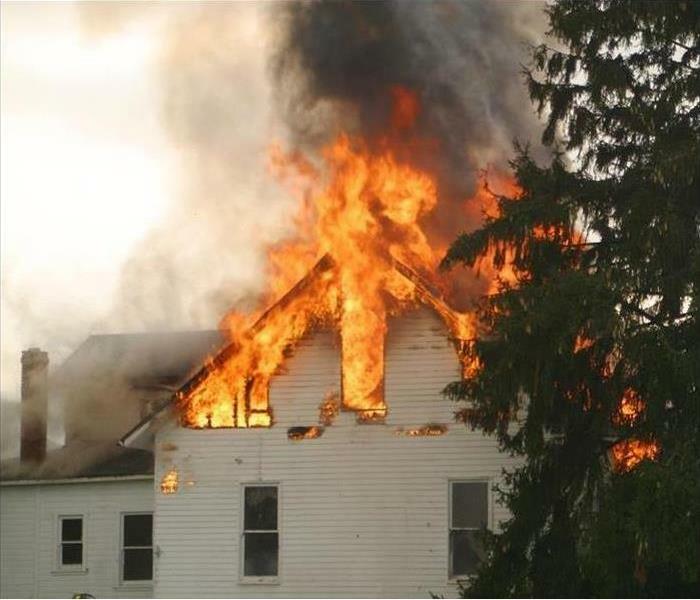 The key to regaining control at this difficult time is finding a fire damage restoration service that assesses the situation and then plans and implements all tasks using well-trained crews who possess the experience to handle all aspects of the multifaceted job. After your call, one of our SERVPRO project managers or an MSR meets with you at your home. After a comprehensive evaluation of your needs, the manager devises a detailed work plan that guides our technicians step by step through the restoration process. If water damage is present, common in fire damage scenarios, that is typically handled first. Then our crew meticulously cleans up the sticky and difficult to remove soot covering surfaces. An oily rag fire smolders, creating thick black smoke that adheres to everything. We have protocols in place for every type of surface affected -- vacuuming and dusting for light soot, spray and wipe for heavier deposits, and aggressive scrubbing with abrasives for the toughest coatings. Immersion cleaning and ultrasonic technology are available for appropriate items. Our team knows how to use these techniques to get the soot out without damaging structure or possessions. One of the most challenging things to eliminate when responding to a fire damage event can be an odor. SERVPRO uses a variety of techniques to remove the acrid stench of this type of fire. First, we discard the rags. Then we try other techniques from cleaning and sealing areas to finding and destroying airborne odor molecules with sprays. Thermal fogging recreates the heat of the fire, combusting deodorizing chemicals which then attach to tiny odor particles and change their chemical composition, neutralizing their sensory effect. We also invested in hydroxyl machines and ozone generators, cutting edge technology that removes even the most persistent smells. SERVPRO of Cumberland, Morgan & White Counties is a full-service disaster restoration company, able to handle every step of your fire damage recovery, including working with your insurer. Call (931) 250-5333 after fire authorities give you the all clear and let us help you return your property to a pre loss condition. Learn more about the local fire department here. Whenever disaster strikes, give our SERVPRO of Cumberland, Morgan & White Counties rapid response team a call at (931) 250-5333. Your Crossville clinic has expensive equipment and tools used to help treat and diagnose the patients that you see throughout the week. With only one severe weather incident, however, the structural integrity of the clinic’s roof can become compromised and allow moisture penetration. With the right level of damage to this critical defense, torrential rainfall and runoff can flow into your building unabated and find its way into examination rooms and office areas of your clinic. One of the greatest concerns for flood damages in your Crossville medical facility is the inability to continue serving the community while these effects get restored by qualified professionals. Our SERVPRO professionals understand the severity of the situation and can help by responding fast to these emergencies with the advanced tools designed to dry up and clean the damaged areas quickly to get your doors open again to the patients you serve. 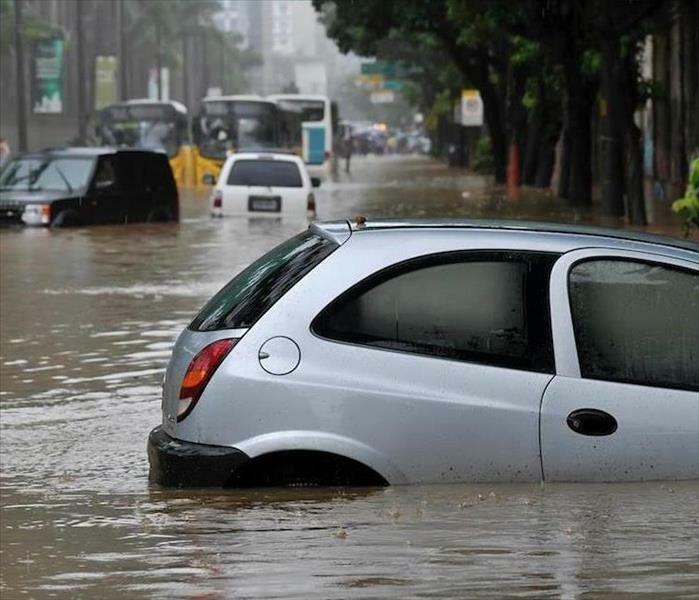 Another concern with spreading flood damages is the effect that this moisture can have on sensitive devices and equipment used to diagnose and treat patients that come into your facility. Our SERVPRO team can help with this by setting our Contents Department on the vital task of pack-outs for at-risk contents of your clinic to reduce this risk. These items can get stored safely in our warehouse after drying, and restoration work on the individual items has occurred as needed. With a fast response to the emergency, there are many areas of your facility that can remain intact after thorough drying efforts from efficient equipment like our high-velocity air movers, dehumidifiers, and our injectidry system that can get used on wall cavities, ceiling materials, and flooring. 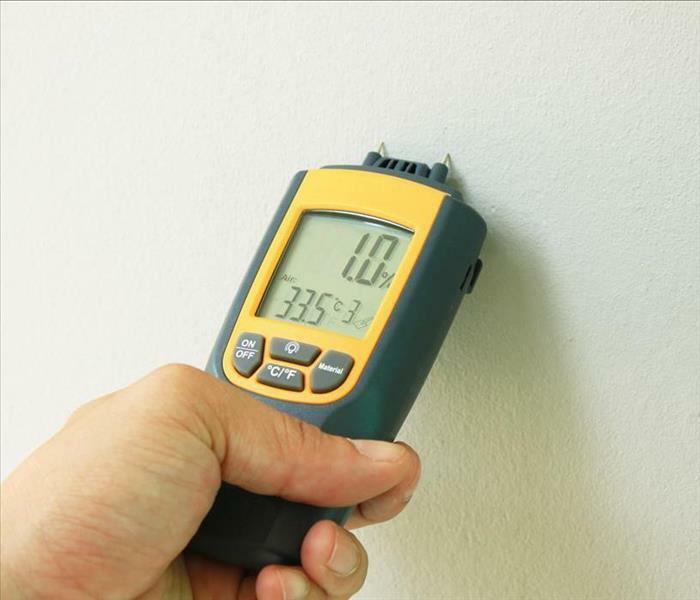 We can use our moisture detection equipment and thermal imagery to identify lingering moisture that requires further drying efforts to ensure that we have eliminated dampness to avoid costly secondary effects like mold growth. While you cannot predict when roof damage can allow flooding in your facility, you can prepare by knowing which restoration team can get there quickly with the expertise and equipment to help. Whenever disaster strikes, give our SERVPRO of Cumberland, Morgan & White Counties rapid response team a call at (931) 250-5333. We can work with you to get your property back to its best after extensive damages, contact SERVPRO at (931) 250-5333 twenty-four hours a day. A major fire in your home can be an extremely emotional situation. Having to relocate to a safe temporary accommodation is hard enough, not to mention anxiety relating to your possessions. We are a service you can trust to provide professional remediation and to go the extra mile in restoring your contents. Extensive damages can often require general contractors, remodeling work and contents cleaning; we are here to help you every step of the way. Excessive fire damage in Fairfield Glade can get expensive quickly. SERVPRO promise to operate with a restore over replace mentality. That means using the latest equipment and industry-leading training to salvage materials. We achieve this primarily by performing a pack out service. That involves creating an inventory of your possessions and moving them to a specialized cleaning facility. The itemized list can include any materials that are considered non-salvageable can be noted for passing on to your insurance adjuster. At a cleaning facility, SERVPRO can use mechanical cleaning methods for expensive fabrics, upholstery, and clothing. We use Esporta washing machines which use hydraulic power to clean up to 90% of soiling on fabrics. For dense materials, our ultrasonic cleaning tanks can restore precious metals or valuables. Not all items can be salvaged after significant property damage, but you can trust us to do everything we can to restore your possessions to preloss conditions. Usually, a major scale fire can damage structural components. A pack out procedure can help to clear space for general contractors to move in and begin repair work on the structure. SERVPRO technicians can make the property safe for contractors to do their work, restore property power and remove potential hazards. We liaise with third-parties on your behalf, so you only have to deal with one company throughout the process. We can work with you to get your property back to its best after extensive damages, contact SERVPRO of Cumberland, Morgan & White Counties at (931) 250-5333 twenty-four hours a day. Click here for more about Fairfield Glade. 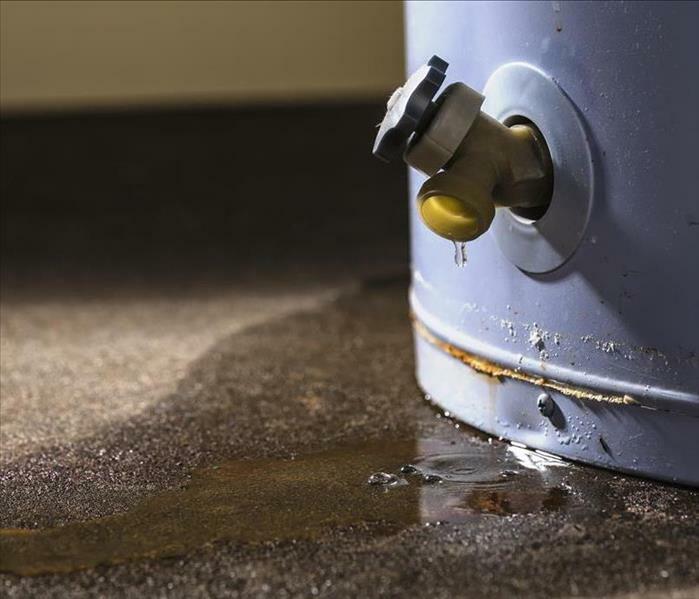 This water heater tank is leaking and could cause water damage in your home. Our trained technicians will arrive on time 24/7 to assist you. When a water heater tank has a seal failure, the result can be anywhere from 20 to 80 gallons of water released into the home. Ideally, the water removal should begin as soon as possible. However, that is not always possible in cases where the water spillage happens when no one is in the home. One Crossville family needed water removal service after a couple of nights out of town when they came home to find their water heater had expelled large amounts of water throughout their home. Their first call after the insurance company was to SERVPRO to begin the process of extracting the water from the affected areas. Technicians arrived within hours and accessed the damage and formulating the best cleanup methods. The water was being handled as a gray water level situation because the water had been in the home for at least 24 hours but less than 48 hours. The truck-mounted pumps were used to pull the standing water from the floors and where the carpeting met tile flooring, the weighted extractors pushed the water from deep in the carpet pad for thorough drying. Only a few furnishings were affected, and they could be raised on blocks and dried in place since only the feet, not the fabrics had been in the water. Air movers were positioned to direct the air up and out of the area while a dehumidifier reduced the moisture to ensure complete drying. Surfaces that were wet needed wiping down with anti-fungal cleaners to ensure mold nor bacteria remained. SERVPRO technicians determined that using a UL fogger as the most effective for deodorizing the hard floors and affected areas to remove the unpleasant odor left behind by the water. SERVPRO of Cumberland, Morgan & White Counties is available for water removal and emergency service 24-hours a day. Contact us at (931)_ 250-5333 and one of our experienced technicians can help you begin the process of restoring your home to normal. Check out a venue suitable for sales or training presentations, committee meetings or even regional trade shows click here for more details. 4/8/2019 - When Odors Linger In Your Crossville Property, Our Crew Is Here To Help!